You’d be foolish to deny the collective power of one of the most influential voices in the U.S. Congress and five men who have become synonymous with personal growth and metamorphosis (and new damn homes, courtesy of Bobby Berk). Today, Representative Alexandria Ocasio-Cortez and four of the Fab Five - Berk, Jonathan Van Ness, Tan France, and Antoni Porowski - converged at the office of Nancy Pelosi. The meeting was a product of a friendly exchange-turned-invite on Twitter: Berk informed the New York rep that he was in town and AOC immediately angled for assistance with an interior decorating crisis, which feels like an accurate response to such news. 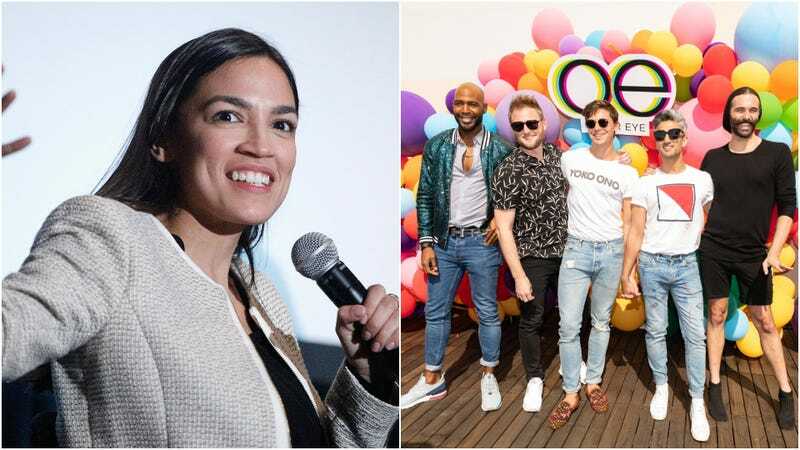 They toured, they snapped photos with fellow congresswomen like Representative Pramila Jayapal, and Van Ness even took a brief moment to lobby for the Equality Act on Instagram. Pelosi herself even took to Instagram, offering her and Ocasio-Cortez’s services as Fab Five stand-ins. So now that this meeting is in the books, Netflix can now mull over at least five different Queer Eye spin-offs.